Unfortunately, investors who were holding out hope for a year-end rally were disappointed. As 2018 came to its end, rising political and economic concerns weighed on global markets. This turmoil capped off a disappointing quarter and year for equities. Among U.S. markets, the Nasdaq Composite fared the worst. It saw losses of 9.40 percent for the month and 17.29 percent for the quarter. For the year, though, the Nasdaq was down only 2.84 percent. The Dow Jones Industrial Average had similar results. It lost 8.59 percent for the month and 11.31 percent for the quarter, contributing to a loss of 3.48 percent for the year. Finally, the S&P 500 declined by 9.03 percent in December. This led to a drop of 13.52 percent for the quarter and 4.38 percent for the year. December’s selloff resulted from concerns over the government shutdown, among other political worries. All three U.S. indices remained below their 200-day moving averages. As such, investors’ long-term outlook on U.S. equities may be turning more negative. But even with the recent volatility, there is reason for some optimism. Fundamental earnings growth continues to be supportive for equities. According to FactSet, the estimated earnings growth rate for the S&P 500 in the fourth quarter is 12.4 percent (as of December 21, 2018). Although down from the third quarter, this result would represent the fifth straight quarter of double-digit earnings growth. Fundamentals drive performance. So, this double-digit growth is reassuring in the face of recent selloffs. From a valuation perspective, the current S&P 500 forward 12-month price-to-earnings ratio is now below its 5- and 10-year moving averages, indicating that the index is relatively inexpensive compared with the recent past. International markets also had a volatile end to the year. Here, concerns surrounding slowing growth in China and the ongoing Brexit negotiations hit markets. The MSCI EAFE Index declined by 4.85 percent for the month, 12.54 percent for the quarter, and 13.79 percent for the year. The MSCI Emerging Markets Index saw losses of 2.60 percent, 7.40 percent, and 14.25 percent over the same time periods. Technically, both indices remained well below their respective 200-day moving averages. Fixed income had a better end to 2018, although the annual results were disappointing. The Bloomberg Barclays U.S. Aggregate Bond Index gained 1.84 percent in December and 1.64 percent in the fourth quarter, as rates fell to end the year. The 10-year U.S. Treasury yield was very volatile in 2018. It started the year at 2.46 percent, hit a high of 3.24 percent in November, and finished the year at 2.69 percent. But the large decline in yields at year-end was barely enough to offset earlier volatility. In fact, the index eked out a gain of only 0.01 percent for the year. The Federal Reserve (Fed) raised rates three times in 2018, as the unemployment rate remains at multidecade lows and inflation measures are above the Fed’s target range. High-yield fixed income, which is typically less affected by rates, had a rough end to the year. It saw a loss of 2.14 percent in December, leading to a quarterly loss of 4.53 percent and an annual loss of 2.08 percent. High-yield spreads have spent the past two years largely range bound. But they increased dramatically in December, as investors reevaluated the risk-and-reward potential for the asset class. Financial markets do not define the economy. So, despite the past few months of market volatility, the economy remains solid. When we look at the economic fundamentals, there is still reason for optimism as we head into 2019. The driver of the current expansion, the U.S. consumer, continues to make and spend more money. High levels of consumer confidence showed that shoppers were willing to spend. Indeed, we have seen solid growth in retail sales for the past two months, including the important holiday season. Personal income and wage growth in November were also healthy. These solid results suggest that spending growth is sustainable. Business owners also remain confident in the economy. Both the manufacturing and non-manufacturing sentiment surveys increased in November. These increases came against expectations for modest declines. 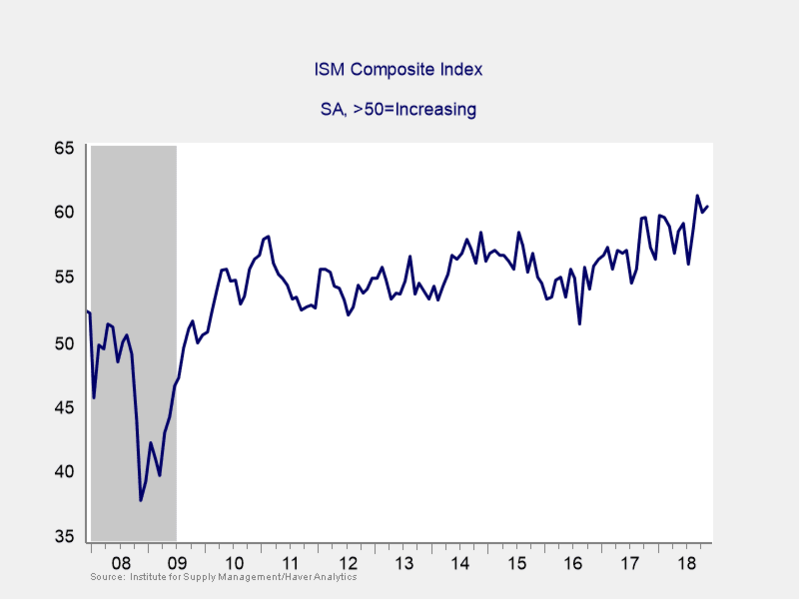 As you can see in Figure 1, the Institute for Supply Management Composite Index shows confidence near post-recession highs. This strong sentiment is encouraging. High confidence levels have historically led to higher spending, which helps grow the economy. Real data supported these high confidence levels, as businesses also continued to spend to end the year. November’s durable goods orders, often used as a proxy for business investment, rose by a solid 0.8 percent on increased aircraft orders. Industrial production also increased in November. Here, though, some cold weather effects likely made this growth figure look better than it actually was. The good news is that business sentiment and investment are positive. Unfortunately, this is not true for one of the other major sectors of the economy: housing. The housing sector continued to disappoint to end the year. Home builder sentiment, which collapsed in November, continued to drop. Pending home sales, which were expected to increase modestly in November, fell by 0.7 percent instead. That said, housing starts actually rose last month, against an expected decline. So, the slowdown may be moderating. Going forward, we do see signs of optimism for housing. An unexpected increase in existing home sales may indicate a moderating slowdown. Further, slowing sales have led to more inventory, which could lead to lower prices and increased activity. Lower mortgage rates will also help. Given the many knock-on effects that housing spending generates, this will be an important area of the economy to watch as we start 2019. Of course, economic worries are real. But what absolutely hit markets in December was politics. The month started with a spat between the Fed and the White House over rising interest rates. It ended with a confrontation between Congress and the White House, resulting in the current government shutdown. Either of these conflicts would have rattled markets. But both in one month did real damage. Fortunately, there appears to be no true threat to Fed independence. And while a government shutdown is certainly worth paying attention to, historically, the impact of a short-term shutdown on economic growth has been minimal. There is even some potential upside here. If congressional leaders and the president can find a compromise, it would likely help markets recover. There were political risks outside the U.S. as well. The trade war with China rumbled on, raising fears of an economic slowdown there. Plus, the British political debacle around Brexit rattled European markets. Once again, markets are now pricing in terrible outcomes. But there is the potential for positive events to lead to a market rally. The resumption of trade talks between the U.S. and China in January is just one example of a potential tailwind. In Europe, more clarity on Brexit would likely lead to a rally in those markets. Heading into 2019, there are still areas of the economy worth monitoring. But on the whole, things look pretty good here in the U.S. Our economy continues to expand at a healthy pace, driven by confident consumers and business owners spending more. Corporate fundamentals also remain strong. Although the effects of tax reform may moderate, continued deregulation should help support these results. As we have seen this year, risks certainly still remain, even in a good economic environment. Political risks are likely to drive volatility in 2019—but it is anyone’s guess as to how and when. Given the volatile times we are in, a well-diversified portfolio matched with an investor’s time horizon remains the best path to ride out turbulent times and meet financial goals.